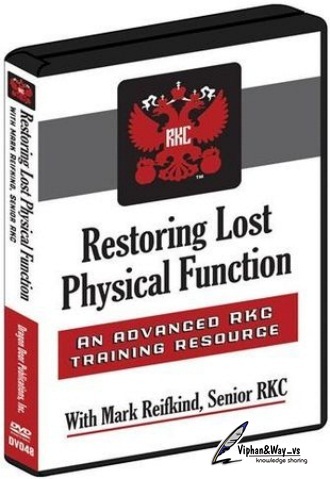 [share_ebook] Mark Reifkind - Restoring Lost Physical Function (2009) | Free eBooks Download - EBOOKEE! Posted on 2012-01-19, by way_vs. A series of brutal injuries ended Mark Reifkind's Olympic hopes in gymnastics, in champion powerlifting, in ultra-marathons and in Ironman triathlons. A resurgent Mark battled back to become one of the premier kettlebell trainers in the US. No one has delved more deeply than Mark into what it takes to beat pain at its own gameâ€”and remain resiliently functional in the face of the most egregious challenges. Having heard of Mark's success at restoring his lost physical functioning, we begged him to share his personal discoveries and methods with our elite RKC kettlebell trainers at the recent RKC II certification workshop. Mark's secrets for restoring physical function would clearly be of immense value to our RKCs, for themselves, but more importantly for their clients. And Mark did not disappoint! In a brilliant, inspiring, impassioned, fascinating, highly practical and, yes, "painful" seminar, Mark blew the assembled RKCs away with his methods for understanding, pinpointing and then releasing blocks in the body. * What are Length Tension relationshipsâ€”and why they are important to your muscular and joint health? * The importance of neutral positioning to the jointsâ€”and how the muscles help or hinder you in achieving this balanced posture. * Tonic and Phasic muscles in the bodyâ€”and how training or lack of training affects them. * How your length/tension relationships determine which muscles to stretch and which to strengthenâ€”and when to do which. * How improper L/T relationships can cause injuryâ€”and how to work around and through them with proper program design. * How everyday activities and postures can seriously disrupt these L/T relationships. * Simple stretches and strengtheners to balance out the musculature. * The critical areas that NEED to be addressedâ€”to avoid back pain and injury. * How to use the KB to address these imbalancesâ€”and build back strength and resilience in the muscles and joints. * What is fasciaâ€”and why does it matter to you? * The difference between muscles and fasciaâ€”and how they are linked in ways most don't recognize. * Why fascial restrictions are more prevalent than previously thoughtâ€”and how they affect parts of the body seemingly unrelated to the painful area. * Why professional massage is usually NOT enough to deal with myofascial problems. * How to use myofascial self release to deal with length tension relationship imbalances. * How to use the foam roller to identify and release myofascial restrictions in ANY muscle in the body. * When and where you should NOT use the foam roller. * Myofascial self release as workout modality. Engage and work the abs, back and shoulders while opening up the restricted muscles. * Other techniques to release myofascial restrictions using sticks, thumbs and vibration massagers. No comments for "[share_ebook] Mark Reifkind - Restoring Lost Physical Function (2009)".